Much is written about the changing way in which emergent Internet technologies will offer opportunities for personalisation of learning. The experience of the Ultraversity project over its 4 year duration illustrates both the challenges faced and some of what might be possible. At the outset, it was decided that the project would use in-house software solutions. This included a wonderfully quirky piece of software called JellyOS (a rich drag and drop graphical interface based on flash technology) for community conversations and the less technically advanced, although far more dependable, e-portfolio tool for resource delivery and assessment purposes (built by Jonathan). The use of in-hose software was driven by a desire to offer users a rich set of online tools with with ‘symmetry’ of use. The idea of symmetry was important to us as it embodies a philosophical position around providing ICT as tools for empowering learners, teachers, and course designers alike without a rigid hierarchy of privileges built into most VLE. In practice, developing JellyOS proved beyond our technical resources and, despite passionate views both in favour and against its continued use, was retired after just one semester and replaced with FirstClass – a proprietary solution that we were very familiar with and offered much of what we wanted. In mid 2004, we began to appreciate that the Open Source Community had much to offer a project like ours and started using Drupal. Initially this was to aggregate staff and student blogs on a website and provide a feed, but also to run our informal induction process (original Drupal induction blog no longer available). At the start of 2005 it became apparent that a replacement for the old e-portfolio and content delivery tool was required. After much discussion, we decided to use Plone open source content management tool. Our purpose was broader as we also wanted functionality more commonly associated with a ‘VLE‘ and e-portfolio. Its attraction to us was that it provided a relative rich set of tools (conversations, web pages creation, RSS aggregation, user groups, etc) that could be made available to all users. Being built on open standards, it also allowed us to integrate other software products like the Gearbox OSS self-evaluation tool. As I write this Ultraversity is still using Plone as its core piece of software alongside FirstClass. 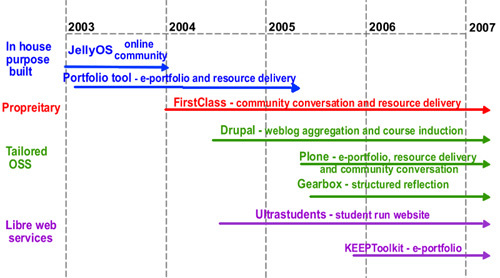 Perhaps the most significant development occurred during 2006 with the use of the KeepToolkit which described as “set of web-based tools that help teachers, students and institutions quickly create compact and engaging knowledge representations on the Web.” The KeepToolkit is built in Plone – presumably the developers were attracted for many of the same reasons as us. It can be described as externally hosted, ‘libre’ software. Clearly there are advantages and issues that arise from using free web service, but it seems to me that whatever the difficulties may be that this is a clear signal of the direction that we are heading. My interpretation of Personalised Learning Environments (PLE) fits pretty well with this approach – that is a PLE is a collection of tools that is controlled by the user. The tools will change over time, some will be integratared and some will stand alone. What is key is that learners and teachers understand that they are taking control and what the implications of this are – there are rights and responsibilities on both sides. Now that the Ultraversity research project has ended, it will be interesting to see if the exploration of different Internet Technologies can continue from within the University faculty structure and be part of a University wide growing “Web of Confidence” or whether it will simply go “Back to the Future” (Jay Cross and Jonathan Star – The Edinburgh Scenarios, 2004). This entry was posted in Learning thoughts on January 25, 2007 by Stephen Powell.